Portrait It is selected to print the document along the length of paper. It is default setting. Landscape It is selected to print the document along the width of paper. To set the paper size and orientation, follow these steps. Choose Page Setup from the File menu. The Page Setup dialog box will appear as shown below. Click the Paper Size tab to display the paper size and orientation options. Select the paper size, either by specifying its width and height or choose the predefined standard paper sizes such as legal, A4, letter etc. from the dropdown list labeled with "Paper size". Choose the page orientation such as Portrait or Landscape. Click OK button of dialog box to apply the settings. It must be noted that you can set the size and the orientation of selected text of document. To do this, follow these steps. Specify the paper size and orientation. Choose "Selected text" option from the "Apply to:" dropdown list box. Word automatically inserts section breaks before and after the selected text with new page size and orientation. 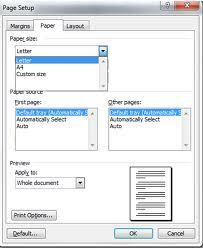 If your document is already divided into sections then select the section's, and then change the required settings.